Australian Government services must use common branding on their websites and print publications. 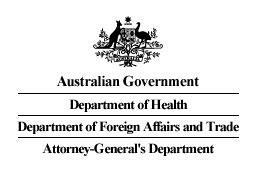 Australian Government departments, agencies and other bodies must comply with the Australian Government Branding – Guidelines on the use of the Australian Government logo by Australian government departments and agencies. The Secretary to the Department of the Prime Minister and Cabinet can grant exemptions or permission to use a co-branded logo. Design templates help you use the official Australian Government branding. Use of the Commonwealth Coat of Arms is subject to copyright. The files are provided in Adobe Photoshop 6.0/Adobe Image Ready 3.0 formats as zipped PSD files. Each element has its own layer and all type and colour are editable. dimensions between the primary elements of the design. Use only Times New Roman for all versions of the design. More information about alt text can be found on the Design System pages. Use ‘Australian Government’ when talking about the national government of Australia. Don’t use ‘Government’, ‘Commonwealth Government’ or ‘federal government’. Where the term ‘Commonwealth Government’ or ‘Federal Government’ was used, replace it with ‘Australian Government’. When discussing Australian Government agencies, write the ‘Australian Government Department of XYZ’. Do not refer to agencies or department as ‘Commonwealth Department of XYZ’. The ‘Commonwealth of Australia’ is the legal entity established by the Constitution. It is sometimes referred to simply as ‘the Commonwealth’. Only use ‘Commonwealth of Australia’ or ‘the Commonwealth’ to describe the entity established by the Constitution, such as in a legal context, or in a geographic sense. There is more guidance on referring to the Australian Government. Only update content to reflect this guidance if the content describes current activities. anything that alters the official record. The Agency design should appear at the top left of every page of an agency website. The design can be used to link to the agency’s homepage. You can put program-specific branding on a site with a version of the design. Ensure consistency between digital and print products. The chosen design should appear at the top left of every page. The design can be used to link to the homepage. The size and placement of the program/product/policy logo or title of the site should not compromise the hierarchy of the design. According to the Australian Government Branding — Guidelines on the use of the Australian Government logo by Australian government departments and agencies there must be a clear distinction between agency websites and ministerial websites. Ministerial sites should not include the Australian Government Design or the Agency Design. However the Commonwealth Coat of Arms may be used. The same principles of applying government branding should be followed wherever possible. That is, the appropriate logo should be applied to every page in a size and placement that does not compromise the integrity of the logo. Where it is not practical to apply the branding according to the instruction already outlined, include the text alternative that is applied to the design. The same principles of applying government branding should be followed wherever possible. That is, the appropriate logo should be applied to the landing or splash page in a size and placement that does not compromise the integrity of the logo. The agency design should be applied to intranet sites. Placement is at the discretion of the agency. We recommend top-left corner. Use the appropriate design in a size that does not compromise the integrity of the design. Where a plain text version of the email newsletter/alert is provided, incorporate the words ‘Australian Government’ in a prominent position. On all forms, use the design in a size and placement that does not compromise the integrity of the design. Agencies may find they have a need to be involved with cross-jurisdictional initiatives or websites outside the gov.au domain either through a sponsorship agreement or entering into a collaborative arrangement. Consider branding. Negotiate to use the design in the most appropriate place on the site that recognises the Australian Government’s involvement, without compromising the intention of the initiative. Ensure recognition for the Australian Government and its partners.